Mike Maiorana is the Senior Vice President for Public Sector at Verizon. He leads Verizon’s business for the Federal, State and Local government, and Education segments across wireline, wireless, cloud, security and managed services. He’s been at Verizon for 27+ years after he started out as an account rep in 1990. Fred Diamond: Why don’t you tell us a little bit about what you sell today and tell us what excites you about? Mike Maiorana: I lead the Verizon public sector organization and basically Verizon enables all of the capabilities of our company for the government space. We’re a leading provider of communication services and as a result of our integrated portfolio specifically understanding agency requirements, having a very experienced team with extreme domain knowledge that is ultimately here to deliver on customer and outcomes and in many cases in our space, mission critical outcome. We take the job very seriously, not only selling the work but implementing and supporting the work. Our portfolio of services is really tailored to meet our government customer’s requirements and includes things such as intelligent networking, managed services, unified communications, professional services, wireless and security. Fred Diamond: Mike, I want to ask you a quick question before we get into your career. We have a lot of Sales Game Changers listening to the podcast from around the globe, they may not know about the federal marketplace and why it’s such an important market and why we’ve interviewed so many Sales Game Changers who service that market. What is it about the federal customer that has interested you so much to devote your career to it? Mike Maiorana: We have a passion here at Verizon to serve those that serve. By delivering and implementing and supporting the solutions that we put forth in the marketplace we are helping our government customers serve their constituency, we’re helping the war fighter fight the war on terror, we’re helping secure the border and so on from a public safety officer and a local community to the highest level of federal law enforcement we know that communications are very powerful and serving the people that are in the communities. Fred Diamond: Very good. You mentioned that of course you sold flowers in high school but tell us a little more about how you professionally got into sales as a career, some of the things that got you into this career. Mike Maiorana: I was at Rutgers, I graduated in 1990 and we had the president of New Jersey Bell, actually, present at the college graduation. I had a marketing degree and I was faced with making a career decision. Thought I wanted to potentially get into advertisement but ultimately ran across an opportunity from someone that said, “I know people that work at Bell Atlantic Mobile and believe it or not someday car phones are going to be really big.” And guess what, they have obviously become very big. I was intrigued by the telecom industry because it was a relatively new space, particularly wireless at the time. People that high wealth or business owners were the primary customers but I thought that getting in on the ground with a good company, with a good reputation, with a new service that had a lot of upside would give me an opportunity. When you’re 22 years old and you’re starting a sales career, you don’t think about how you’re going to be at your 28 years and have 11 different roles but I was pretty focused and motivated as a kid coming up through school around grades and working part time playing sports and what not and I took the opportunity to really get to know the products and services, become an expert. You have to be an expert at the products and solutions that you’re selling. If you’re not, your customer doesn’t really even need you with the help. I have always been able to connect with people, I’ll just say I’ve been likeable or I am likeable and be able to create a relationship and a trusted relationship so people if they’re going to buy a product or a service they want to deal with people that they like and they certainly trust. Fred Diamond: The 11 jobs that you held, have they all been in sales related positions? Mike Maiorana: Sales general manager type roles and I’ve been in both retail as well as corporate as well as government and the beauty of it is you really can bring forth the same motions, if you would, the same core competencies. Certainly the different cycles, different solutions, different means to go to market but there’s some basic key things that I still leverage that I think I learned from Tom Hopkins when I was listening to his tapes 27, 28 years ago. Fred Diamond: And now people listen to podcasts such as the Sales Game Changer. Mike Maiorana: [Laughs] I didn’t mean to advertise the competitor for you there, Fred. Fred Diamond: Well, if I become Tom Hopkins after this particular podcast, I’ll be very happy. Mike, what are some of the key lessons you learned? Mike Maiorana: You’ve got to connect with people, you’ve got to be personable, you’ve got to take the time to listen. Too often sales professionals want to talk and talk about all that they know about a product or a service or a solution without really connecting. I call it earning the right, you’ve got to earn the right to talk about your products and services, only after you’ve established a relationship and fully understand the customer and the customer’s situation. I think I’ve already said you’ve got to be a solutions or a product expert, you have to understand how your product or solution will be utilized, how the customer will utilize that product or service and ultimately be in a position to advise the customer. I also learned that sales is not a nine to five job. You have to be dedicated and treat it like it was your own business, very entrepreneurial. That means taking customer calls whenever they call, because if you don’t answer, they’re going to call somebody else but a dedication and a commitment around putting the time in to learn your territory, learn your products, learn your services but also dedication around cold calling and prospecting and following up. Following up is critical, you get a call from a customer with a question, you better call them back. I also say being a team player is important. You don’t want to be a lone wolf. Most of us work in a sales office where there’s multiple sales people, you want to be in a position where your team wants to help you, that means you want to help them as well. Fred Diamond: I have a question. You brought up the word listening and there’s a couple key themes that have come through on a bunch of the Sales Game Changers podcast. Mike, I want to talk about listening for a second before we talk about your area of brilliance. You’re absolutely correct, that comes up all the time. We heard previous guests talking about the 66% solution, you have two ears and one mouth, use them in that order if you will. Give us an idea or two or a tip or technique or something you’ve learned along the way to become a better listener. Mike Maiorana: When you listen and you give eye contact, you are showing to the person you’re working with that you care and that you’re taking the time to really understand their situation so that immediately elevates the trust factor. That gives the prospect confidence that you’re going to recommend a product or a solution that is purpose built or purpose fit for their specific needs, not because you have a quota for it, not because your company is giving you spiff to sell it. You are really endearing to the customer and over the long haul if you endear yourself to a customer and you do right by them that just creates tons of opportunity. At the end of the day, our best sales people are those that get repeat business from customers and those that get references and referrals from customers to other customers but it really starts with, I’ll say establishing trust and being likeable but that starts with listening, not pretending to know exactly what the customer is going through or what their needs are. Certainly there’s a ton of opportunity to do research in our space. Our people know what is happening at XYZ agency, but they don’t necessarily know what’s happening from the perspective of the person they’re working with and to show the right level of respect for that person I think is critical. Fred Diamond: Let’s talk about you for a second, here. Tell us specifically, Mike Maiorana, what are you specifically an expert in. Tell us a little more about your specific area of brilliance. Mike Maiorana: I think I’m a very good sales leader around collaboration and trust building. I think that a sales professional has to have the right level of technique to be able to effectively build trust and collaborate with two sets of people: external customers, getting to understand the customer’s business – in my case, they’re a government agency’s business – and really be in a position to advise and propose solutions that deliver on the desired business outcome but also collaboration and trust building internally. What do you mean internally? I’ve always found it wise to have strong internal relationships with the different support organizations that a sales person depends on to get things done. The people that put out the proposals, the people in finance that approve the deals, the people in legal that write the contracts, the people in IT that help develop the software, the people in customer service that ultimately support the customer. I believe our best salespeople have a terrific ability to create internal teams that they can rely on. The product team, the marketing team, even HR to a point where the company is supporting their initiative to make a sale with a client. It’s a team sport, it’s not an individual sport is what I’m getting at. Fred Diamond: You’ve been at Verizon for 27+ years, nearly 28 years. Again, you’re heading a public sector right now. I’m sure there’s some people along the way that have helped you reach this level, that have mentored you along the way. Could you tell us about one or two impactful sales career mentors and how they impacted your career? Mike Maiorana: I have worked with a lot and I thought about this question. There’s a woman that I work with probably in five different roles either as a peer or I worked for her in her organization, her name was Christine Baron and she had an uncanny ability to create great external, meeting customer relationships, become part of the customer and act on behalf of the customer, be an advocate for the customer, understand their business and really be in a position to propose wonderful solutions. She also had a great uncanny ability to create those internal relationships that I talked about. At a large company like Verizon, you need an internal team behind you to support you to be successful and I cannot stress enough to this audience how important it is to establish trusted personal relationships with the internal teams and that doesn’t mean sending them an email, that doesn’t mean getting them on a conference call with 25, 30 other people. It means having one on one personal dialogue. It means getting to know what their priorities are and how you and your role can help them succeed in their role. When you’re in a position to help others succeed in their roles, they are more likely to help you when you need the help. Fred Diamond: I want to now talk about some of the challenges. What are two of the biggest challenges you face as a sales leader today? Mike Maiorana: I have a big business with a lot of responsibility. I’ve got to deliver on short term, tactical objectives, plus monthly sales quota, monthly bookings targets. I also have to plan to achieve long term strategic initiatives so having my team aligned and my actions and initiatives aligned to be able to achieve the short term, monthly, quarterly targets but also be looking over the horizon to know what I’m going to deliver in first quarter of 2019. That’s something that doesn’t happen overnight, doesn’t come overnight. I think also achieving 100% cross functional organizational collaboration and commitment, I call it a team 1 approach meaning the team that you manage has one responsibility, they have responsibility to each other to deliver on the unit’s objectives. Even if they manage another team, their #1 responsibility resides in helping each other, having that trusted internal relationship, being able to lean on each other, to work with each other to solve problems and also to strategize. We do a good amount at Verizon, we do a good amount of talking about what is the next move, how are we going to approach this problem that we’re going to see in six months and in a year. With the large federal procurements you have to be involved in those 2, 3 years out in many cases. I think balancing short term tactical with long term strategic initiatives and achieving 100% cross functional organizational commitment are two of the things I work on real hard. Fred Diamond: Mike, you’ve been with Verizon for 27+ years. Obviously, it’s one of the leading companies in the world especially in the public sector space. Why don’t you take us back to one specific sale success or win from your career that you’re most proud of? Mike Maiorana: I was moved down to Washington DC from the Philadelphia market to create the Verizon wireless national government team and secured our first GSA schedule 70 wireless contract. Believe it or not, 15 years ago Verizon wireless did not have a wireless contract. My biggest success was securing that agreement with the GSA, what I’m most proud of. The team that we put together to do that and now seeing how that has blossomed over what is now 15 years, seeing the customers that we’ve been able to help and assist, having those decade plus relationships with those customers, seeing how the technology has evolved that ultimately has improved on how those customers do business and their mission outcomes but then also seeing the people that were involved then, many of them still with us. A very important factor of succeeding in a segment like government is having people with extreme domain knowledge and experience and what we do at Verizon in a segment like government, we’ll move people into different roles but keep them within the segment to give them the background and experience they need to be able to execute effectively. Fred Diamond: Your customer is demanding more value now, it’s one of the key trends that we hear in the Sales Game Changers podcast as well as that the customer demands value and you need to provide. You’ve always had to provide value as a sales professional but now even more so, you now need to intimately understand their mission and they’re looking for you to bring them some ideas that are going to help them solve their problems and deeper achieve their mission. Mike Maiorana: We’ve got decades of experience here, but the good news is we’re also bringing in new talent every day. We’re growing our business, we’re bringing people in from other technology companies, we’re bringing in people from the military, Verizon is very supportive of military hiring, veterans hiring initiatives, people that again have extreme domain knowledge and are connected to the mission. Again, we are very proud of all the customer segments that we serve here at Verizon but our government customers have a higher calling and they depend on our services to do very important work for our country and for our communities. Mike Maiorana: I can honestly say no. Certainly when you’re starting new, you’ve building your book of business, it is hard. Your phone doesn’t ring, I need this, I need that, you own your business, you’ve got to build up your book of business so out of the gate I think any first year sales professional really has to hustle. They’ve got to prospect, they’ve got to network, they’ve got to be working morning, noon and nights to generate a customer base but once you generate a customer base and you have that referral business coming in and that add on business, you actually make good money. I bought my first house as a 23 year old because I make good money because I was really selling a lot of services and that and the thrill of victory, the close, it’s a natural high so that has driven me to stay in sales. Mike Maiorana: I’ll frame it up in two different categories. You’ve got to know your products and your solutions and how they apply to the customer you’re selling to, what business outcome will that customer be able to achieve by using your products or solution. You’ve got to know your customer, you’ve got to know your customer’s business – in my case, the federal business, the mission, the specific outcome they’re trying to achieve. You have to invest time to do both, but let me just flip it a little bit. I already mentioned you’ve got to be likeable and you’ve got to be trustworthy. I always say this, you want to be able to be in the supermarket on a Saturday and see your customer and walk up to them, shake their hand and look them in the eye versus hiding in the other aisle because you have a reputation. When you’re selling you’re not only representing the company you’re selling, you’re representing your own personal brand and your own personal brand can have a lot of power over time as you build up your book of business. That means you’ve got to stay to your word, you can’t over promise and under deliver, you’ve got to follow through on your commitments, you’ve got to be there when the customer has issues and help them shepherd through and solve those issues. I mentioned earlier that you got to be a team player, you’ve got to be able to have the support of your support teams backing you to get you to where you need to be. Above all else, you’ve got to have integrity. You’ve got to sell with ethics. If you want a sales career, it’s not a hit and run type of business. You have to recognize to advance your career in sales you’ve got to develop a universe of trusted customers, trusted internal partners as well as trusted external partners. As you would expect here at Verizon, we work with a host of other technology providers to complement our solutions to bring forth our programs to the government. All through that you’ve got to stay to your word. Fred Diamond: Mike, what are some of the things you do to sharpen your saw and stay fresh? 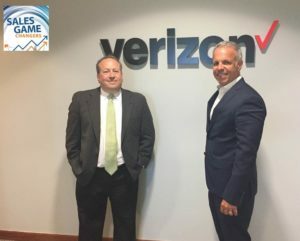 Mike Maiorana: A great day for me at Verizon is when I do one if not all three of these things: I meet with customers, I meet with senior level customers to ensure that I understand what they’re trying to accomplish and to also establish that trusted relationship that we need to be a long term partner. I meet with industry partners, I work closely with other technology companies with large integrators and small businesses to be able to better understand how by partnering, Verizon can grow our business. Then certainly I meet with my people. Today, I’ve had at least three meetings not only with my direct team but with my frontline team. When you meet with your frontline team, you get an unfiltered version of what really is happening. You get to understand the details about the opportunities and specifically where you can provide help to get them to where they need to be, including removing obstacles. So meeting with customers, meeting with business partners and meeting with my people help me stay sharp. Mike Maiorana: Talent development and succession planning. We are continually bringing in new, hard charging, intelligent, diverse people into our organization to put us, Verizon, in a position for long term continued success. Just last December, one of my senior VP’s retired. I had to find somebody else. We already had a succession plan in place and we chose the person to replace him, obvious choice. You have to, in a leadership role that I have, to ensure continued success of the business and I correlate continued success of my business to continued success for me because I’m paid to get results, is to have the right discipline and activity around succession planning and talent development. Fred Diamond: Very good. One of the themes that’s come across for the Sales Game Changers podcast has been the #1 challenge is hiring, retaining and motivating top tier talent. That’s one that comes up frequently and we’re doing some things to help. Mike, you’ve given us some great insights here. Mike Maiorana: Government’s a challenging segment, but it’s a higher calling so when you’re supporting the customers that we support, there’s a lot of pride in that. We also like to develop people here at Verizon to take on other roles at Verizon. I’d rather see one of my people get promoted into a new role or move into a lateral role in Verizon than have to do that outside of Verizon and that’s how I keep people long term develop that domain knowledge, keep those customer relationships. Fred Diamond: What is it about sales as a career – 27 + years at Verizon – that has kept you going? Mike Maiorana: It’s really the positive emotional energy that is generated from a win-win situation. Customers procuring service from us are able to do things now, to improve their workforce productivity, provide better citizen services to be more effective at the role that they have. I like to say that our job at Verizon is to get our customers promoted. When they make a buying decision with Verizon, they’re acting not only for their agency or their company in the enterprise space but the decision is personal so how do we help generate that win-win? And when a customer wins and a customer buys, clearly we win also. We generate the revenue as associated but you develop that now cycle where they bought, we delivered, we supported, we developed that trust, now when they want to buy again, guess what? They’re going to come to us first. When we want to be introduced to another client in a similar situated role at another agency, we’ll have a reference so that win-win knowing that not only are you delivering for the customer at the agency or enterprise level, you’re delivering for them personally and certainly the win for us, that thrill of victory, that risk almost versus reward type of a mentality certainly has kept us going. When it comes to federal, we don’t moonlight in government. We are trained professional experts in navigating the waters. I don’t let my team tell me that we have budget cycles and their sequestration – federal government spends a lot of money. It’s up to us to position Verizon’s strengths and value add to get at that money but you’ve got such extreme domain knowledge here, people are in the federal marketplace for a long haul that are successful really know how to navigate those waters. Fred Diamond: Why don’t you give us one final thought to inspire our listeners around the globe? Mike Maiorana: Keep customers first. Establish long term trusted relationships with your customers both internally and externally. Be at that team player, develop those relationships, be the go to person for the industry that you serve at the company you serve and have fun. This is a hard career, it takes a lot of dedication, a lot of hours, a lot of intense workload in many cases, enjoy it and if you enjoy it, that emotion is contagious with your customers. Customers want to buy people that are positive, that have a great outlook on things, that understand what it takes to deliver for that important mission outcome and I really respect the sales profession and we’re looking forward to continuing to do great things in the government and our great salesforce is right behind it.